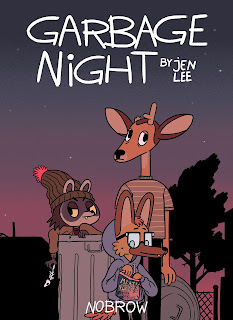 Jen Lee's Garbage Night came out recently. It follows the same characters she introduced in Vacancy, and takes place in the same world as her webcomic Thunderpaw. (I wrote about that interesting dynamic here.) The short version is that humans seem to have disappeared off the face of the planet and the animals are just trying to get along. Obviously, this isn't much of an issue for those who grew up in the wild, but the domesticated animals are having a more challenging time. 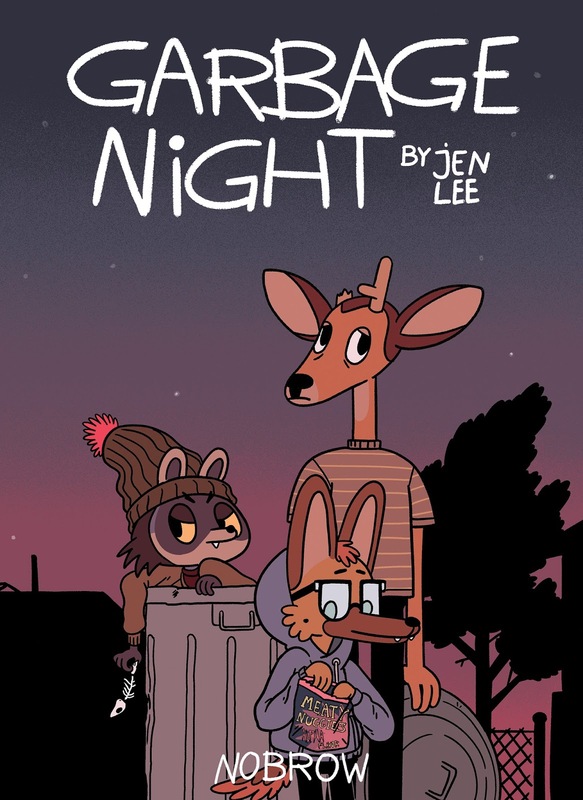 With Garbage Night, we follow Simon, Cliff, and Reynard as they decide that, with pretty much all of the local food sources (garbage cans, abandoned grocery stores, etc.) drying up, they're going to try their luck in the next town. This is actually the suggestion of a wanderer called Barnaby who they happen to bump into. Simon is fairly struck by Barnaby's apparent resourcefulness, while Cliff and Reynard are considerably more skeptical. The book follows their journey to the next town, with Barnaby proving that Cliff and Reynard's skepticism is indeed warranted. Simon is ultimately put in the position where he's forced to choose between Barnaby (who has a better knack for survival) and Cliff/Reynard (who respect him). The story is very character driven. Each of the characters have very distinct personalities, and have unique approaches to and outlooks on their prospects. Personally, I'm most interested in the dynamic between Simon and Cliff. The other relationships are relatively easy to read, but I like that there's something more complex going on in the Simon/Cliff pairing. And it's those relationship dynamics more generally why I'm bringing this up under my "On -isms" heading. Because all of the characters are anthropomorphized animals, we don't come to the table with a lot of pre-existing baggage about who they're "supposed" to be. Particularly since Lee's style is cartoony enough that it abstracts the characters' species -- you can tell Simon's a dog and Cliff's a raccoon but their exaggerated features push those features to the background. I don't know that Lee did this to deliberately avoid having readers think about race -- the story is, at its root, about animals living in a humanless world -- but it is an interesting side-effect. Of course, it's never "injected" but a creator's own internalized biases being put on display whether they're consciously doing it or not. I think some creators know this, and fear that they harbor negative social biases that they don't realize are harmful or insulting. "If I put a Black person in this story, will it be read as tokenist?" "I don't think I can write someone speaking English with a Japanese accent without it sounding like a bad stereotype." "How do I visually show this character to be a Native American without resorting to outdated cliches?" To avoid the issue, they try to avoid putting any races in their story. Which, if the characters are human, is unavoidable. White people aren't a "default" or "normal" setting for humans, so if that's all a creator uses, they're still showing their biases. And I think some people are starting to realize that too. So I'm just wondering who, if anyone, has deliberately resorted to using truly race-less options precisely because they didn't want to touch the race discussion with a ten-foot pole?